Liquitex Inks 30ml. 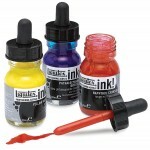 See the Colour Chart here Liquitex Professional Acrylic Ink! is a range of extremely fluid acrylic paints that use super-fine pigments in a state-of-the-art acrylic emulsion. 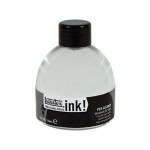 They dry quickly, are permanent, water resistant and non-clogging, which makes them ideal fo..
Black - Acrylic Based - 150ml .. 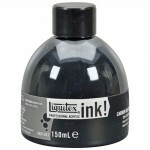 Ink Solvent - Acrylic Based - 150mlFormulated for use with Liquitex Professional INK! RangeIdeal for cleaning pens between repeated useIncludes 5.1-oz / 150ml jar of cleanerIntermixable with Liquitex Professional Acrylic Paint Colors and Mediums.Conforms to ASTM D4236; Safe for educational use ..